The armored shells of some marine mollusks have evolved to satisfy two conflicting design requirements, protection and sight, a new study shows. Although many biological tissues serve more than one purpose, rarely are tissues optimized to do multiple tasks well; doing one task efficiently typically comes at the expense of performing another at such a high level. Understanding these tradeoffs, particularly in examples from nature, is important to scientists seeking to develop innovative materials. Here, Ling Li and colleagues studied chitons - the only mollusks with living tissue in their hard shells. Specifically, they studied the chiton Acanthopleura granulata, which has eyes with mineral-based lenses dispersed across its spiky shell armor. 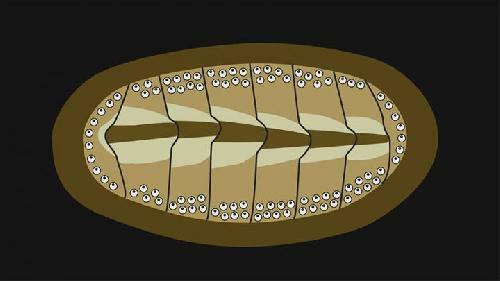 Recent research has suggested that this chiton species may be capable of spatial vision. Li et al. performed optical experiments on individual isolated chiton eyes in the shell to demonstrate that these microscopic lenses are able to form images, or "see." This allows the chitons to visualize and quickly respond to approaching predators (clamping to the substrate below them so that they cannot be dislodged from it). The results also reveal that as the size and complexity of individual chiton eyes increases, the local mechanical performance of the armor decreases - highlighting the trade-off between the two tasks.